Unlike at a typical restaurant, the combination of items on a plate at the Rodizio Grill is likely to change throughout the meal as servers make their rounds offering different meats to try. Photo by Cindy Deifenderfer /Times Free Press. This story was updated at 5:18 p.m. on Thursday, Jan. 25, 2018 to correct prices for various dishes. Ordinarily I wouldn't suggest that one knowingly enter a building in which multiple adult males are regularly approaching you with large, sharp-edged butcher knives in one hand and long, sword-like skewers loaded with semi-rare chunks of animal meat in the other. But at Rodizio Grill, the Brazilian Steakhouse inside Hamilton Place, those weapon-wielding meat merchants are actually your new best friends and you'll be happy to invite a steady stream of them to your table. For those who've never visited an all-you-can-eat churrascaria-style Brazilian steakhouse, the main attraction is, of course, meat. Lots of meat. A vegan's worst nightmare. But to get the proverbial meat ball rolling, one first has to order "the full Rodizio" ($21.99 during lunch, $23.99 at brunch, $32.99 for dinner), which includes the impressive unlimited Brazilian sides, gourmet salads and rotisserie-grilled meats. If you're not up for the full Rodizio, you can opt for the unlimited salads and Brazilian sides only ($15.99 at lunchtime, $16.99 at brunch, $22.99 at dinner). 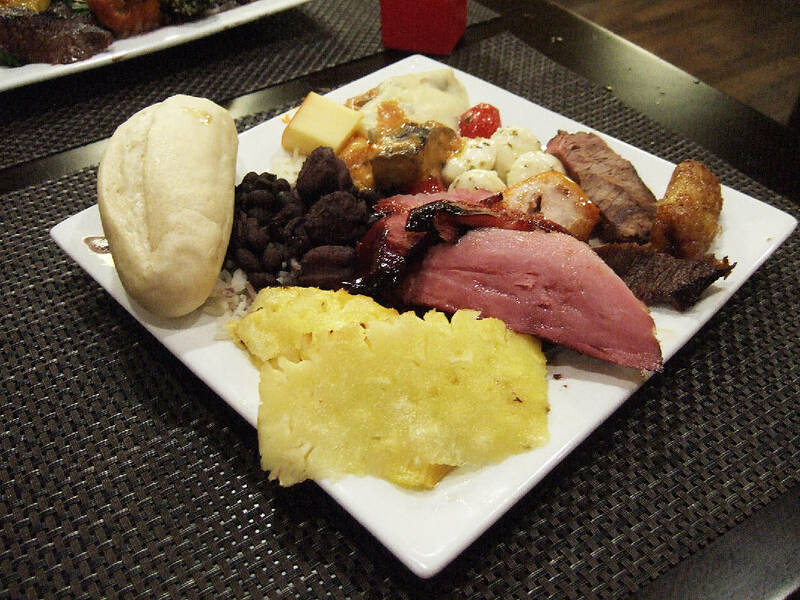 The cold salad selection is extensive and fresh, and the hot bar features, in addition to staples like mashed potatoes, traditional Brazilian dishes such as feijoada (a black bean and sausage stew) and couve (sauteed collard greens and bacon). Everything is so attractive and delicious-looking that it would be easy to overindulge here and leave little room for the main attraction, so enjoy with caution if you've come for the meats. Servers file out of the kitchen with meats that have been grilled on a long skewer over a rotating rack (the rodizio) and a carving knife to cut off as much or as little as you'd like. They circulate around the dining room to offer each item to every diner, and it's your decision which offerings to either choose or take a pass on. Patrons are equipped with a small pair of tongs to be used to grab the meat as it is being sliced from the skewer. Each table gets a reversible, red-and-green-painted, carved wood figure to indicate level of service desired. If you've turned the indicator to show green on top, that means, "Yes, please come to my table with more delicious meat." If you've turned the red side up, you've indicated "No, thank you. I need a breather." And when you've finally reached your limit, lay the indicator on its side and your server will get the message that he can start getting the check ready without even having to ask. Our server, Chris, was friendly and attentive to our needs, and the guys who were in charge of keeping the grilled goodies coming certainly did their jobs well. The variety of meats is such that you aren't likely to see the same items too often, although if you do have a favorite you can let a server know that you'd enjoy a serving of that soon. Don't miss out on one of my favorites, the Abacaxi: fresh glazed and grilled pineapple. It pairs perfectly with grilled ham. P.S. The national cocktail of Brazil is a caipirinha, which is made from chunks of lime, sugar, ice and cachaça, the Brazilian cane spirit. I totally recommend getting one of those. On this visit, I started with a selection of hot dishes from the bar and a roll. I particularly enjoyed the feijoada and the beef stroganoff. Then I snagged a couple servings of chicken and beef (loved both the maminha and bife com alho, as well as the frango agri-doce), and thoroughly enjoyed the ham and grilled fresh pineapple. The restaurant is located inside Hamilton Place on the I-75 side between Sears and Belk. Customers can enter from either outside or inside the mall. The dining room is fairly large, with room to seat 400 at a mixture of tables and banquettes. The somewhat masculine decor features various wood elements and comfortable chairs. The lighting was just a tad too bright for dinner, but not annoyingly so. This was my first visit to the Hamilton Place location of this establishment, and though I now know that I am partial to the atmosphere of the downtown location, it was still a good experience. Because of where I was seated, I was painfully aware I was at the mall, but other than that, it was perfectly fine. I certainly had enough to eat, and didn't dislike any of it. I'd recommend it. Contact Cindy Deifenderfer at cdeifenderfer@timesfreepress.com or 423-757-6362.